For this week’s #AskAwayFriday, my first of the New Year, I met April from the 100lb Countdown and April Noelle is Finding Favor. April is a mom, wife, and blogger who wants to inspire people to be better at managing their finances, family and fitness as well as enjoying some quiet time, April left a high paying career to become a stay at home mom to change the priority from work to family. 1) You seem to have fully embraced the name SylvaFae. I, on the other hand, am nothing like April (spring or open) and Noelle (Christmas). Have you ever wanted to be named something else? I love the name SylvaFae, I chose it especially to fit in with the woodlands / woodland fairy theme. It fits the style of my blog perfectly so yes I have embraced it. In fact, I’m so used to people calling me Sylva on social media, it’s like having a nickname but one you’ve chosen yourself. 2) Do you have a favorite part of the woodland that you find most relaxing? Sitting on a log at the camp fire with a cup of coffee watching the children play. Bluebell Bank in the spring when the floor is a carpet of blue against the new green leaves. Lazing in the magic clover patch on the edge of the Secret Field, finding four leaf clovers with the girls and making wishes. 3) What’s your favorite genre and author to read as an adult? In the past I would have said a psychological thriller and picked some mainstream author. Now I have new-found friends in the indie author world and have become a strong supporter of independent authors. I read lots of different genres now. I’ve just finished Darkly Wood by Max Power, I’m currently reading Henchmen by Eric Lahti and I have Lesley Hayes’ new novel Round Robin next on my list. I can strongly recommend all three authors. 4) The Chronicles of Narnia was one of my favorite series growing up. If you wrote another book for the series, what would it be about? 5) Besides the community (or making friends), what’s the most surprising thing about running a blog? Just how addictive it is. If I’m not writing something for my blog, I’m thinking about my next post. I get anxious if I go through a day without reading or writing. 6) Have you ever been to the US? If so, where? If not, where would YOU want to go (not for your children)? When I was a teenager I spent a few months touring the US. I flew into Florida, drove across to California for the 4th of July celebrations on the beach. I then travelled back across and up, to pop over the border into Ontario to stay with my lovely aunty for a week, then back down the coast to Florida. I think I went through about 26 States – all equally beautiful and so very different. I also spent a fortnight pottering down the Florida Keys – as a teenager this was my favourite place and one I’d love to go back to as an adult. 7) Your post “Little Fae Dreams” was inspiring. How do you get your children to be so articulate at such young ages? All three are very creative and have vivid imaginations, if somewhat bizarre at times! I guess they’ve just grown up in a house overloaded with books and storytelling is the norm. I also think that giving children the opportunity to play freely helps develop their creative thinking. My girls disappear off at the woods to create their own games, chattering away to one another. Trust me though, when my middle daughter launches into an hour long, high speed monologue just as we’re settling them off to sleep, I wish they weren’t so articulate! 8) What’s the best trait that each of your children picked up from you? All three inherited my long curly hair but thankfully for them, they got the rest of their looks from their two nanas. Characterwise, they got my creativity and imagination. They also inherited my clumsiness, ability to fall over anything, lack of rhythm and always end up the scruffiest children by the end of the day. Luckily, they also inherited their dad’s intelligence to balance out my dippiness. 9) Tell us about your best day? I can’t think of a single best day I’ve had. If I could combine the births of each of my children, seeing my babies’ faces for the first time, smelling that new baby smell, I guess that would be my most memorable day. The range of emotions was so intense, pain and ecstasy in equal measures. I was one of those strange people who enjoyed giving birth! 10) Describe your dream home… location, size, scenery, etc. My dream home would be located on the Secret Field at the edge of the woods. In this fantasy I would transport our little 17th century cottage there. I would expand it slightly to include a games room for my husband (to hide away with his toys and gadgets), a big playroom for the girls to keep all their toys in and a library for me, with wall to ceiling books and an antique desk to type at. This looks like a lot of fun. How did you get started with Ask Away Friday? I just joined their FB page. Really easy now that I’ve sussed out the link up! Actually I sent you 10 questions before Christmas to do an AskAway but we were both busy. Not sure how relevant they are now. 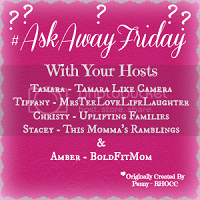 I am booked for next Friday but will do an AskAway swap with you on the 30th of January. I’ll email you with more info if you like. Ha ha! Did you like your bits? What a wonderful swap! I would love to have a little 17th century cottage in a sprawling landscape of trees and rolling hills. A girl can dream! Hope you have an amazing weekend! A lovely dream… someday. You have a great weekend too. This was a wonderful swap. Your woodland sounds so amazing. I would truly love to visit someday. Maybe I should organise a virtual woodland party – bring your own marshmallows! That cottage sounds beautiful. I’m desperately trying to read this year! I used to always have my nose in a book, but I haven’t read a book from cover to cover in a while (only one each of the last two years). I have a lengthy list. I really need to get more organized so my babies can have the full range of their articulation. Right now, Bee talks a lot, but I only understand what she says some of the time, when she’s telling her stories. Amazingly, when she wants something, it’s as clear as day! Thanks for swapping with me. Thanks for the swap! My advice is to always make time in your day for reading, even if it’s just five minutes – but you know all that supermum! I can definitely recommend Lesley Hayes’ books if you want to get back into the habit – she’s done a few short story books if they’re easier to fit into your busy day.